Perhaps you’re reading here because you’ve got the bug and the desire to find the fastest racing drone for your budget and ambition? Welcome to the club. This is a new and exciting sport like none other. It wasn’t so long ago that consumer drones or unmanned aerial vehicles (UAVs) were rich kid’s toys. It’s not like that now. Today anyone can take to the skies and enjoy the wonderful world from above. Drone racing is not only fast and exciting but it’s also becoming big business. To put that another way, the best racing drone pilots are able to take their ambition up to a more professional level. It’s not the purpose of this guide to give flying tips or schedules for drone racing events. We’ll leave that for another guide. This page highlights some of the fastest budget drones available. It’s important to answer a few basic questions before I get into the reviews. Armed with a little knowledge you’ll be able to make the best buying decision based on finances and expectations. What is First Person View (FPV) exactly? Do I need special FPV goggles for the drones I like? 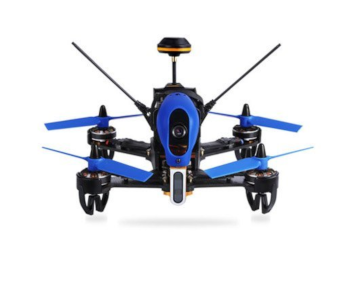 What kind of things should I look before buying a racing drone? 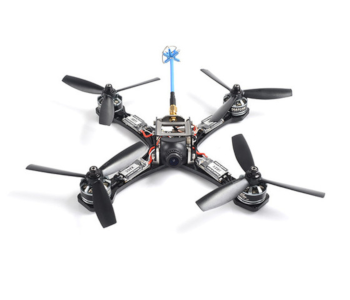 Should I buy a RTF (Ready-To-Fly) racer or an ARF (Almost-Ready-To-Fly) craft? How important are frame materials—does everything have to be carbon fiber? Are brushless motors worth considering? Don’t need an introduction into twenty-first-century drone racing? No problem: jump to the reviews here. I advise the rest of you to read this short intro. Tiltable FPV camera, fast and responsive. Beautiful design, fast racer, robust and responsive. Strong carbon, anti-shock body and brushless motors. There’s more to consider when buying a racing drone than speed and acceleration. It’s no good having the fastest drone in the sky if its battery dies before the others. Flight time is a vital consideration. The build quality and overall reliability of a craft are two more crucial factors. How well will the racing drone stand up to crashes and collisions? How easy is it to fix? How accessible are replacement parts? The operating software and pilot’s flying skills also play a major part. As you can see, the fastest racing drone may not always be the one to win races based on mph alone. It’s down to lots of other factors. Operating range (distance) is another thing to consider. Overwhelmed already? Don’t be. Everything will come together once you start to read this no-nonsense guide, of that I can promise. I don’t use overly technical jargon in my guides. When there’re simpler alternative ways to explain a thing I use them. If a technical term is unavoidable I’ll explain what it means in layman’s terms. Who Is this Racing Drone Guide For? This guide is ideal for first-time drone racers but it’s not only for the novice. Experienced racing drone pilots may find these reviews useful as a way to keep up on the latest racing quadcopters and features. You’re certainly in the right place if you’re a newbie wondering where to start with the technology. Even guys who get to be Guinness World Record holders started with zero knowledge or know-how. This guide is not for kids. There’s a lot of responsibility that comes with racing drones. This applies even at the entry-level and with the more toy-like flying robots. Some people like to race their camera drones. But an average camera drone is not the same thing as FPV racing crafts. Camera drones fly slower and lower for one. Most aren’t built for speed competitions. The cameras on racing quadcopters are different. Their purpose is not to capture cinematic quality video or amazing still images. When you race you have to be in the virtual pilot seat and see ahead. For the ultimate remote-person view (RPV) you need to wear a pair of quality FPV goggles. If this is something you haven’t done yet then prepare for the experience of a lifetime. You can also experience FPV via an external screen. It will need to be a decent size for serious drone racing and not the tiny window found on modern smartphones. It’s the little things that make the biggest difference when it comes to fine-tuning a drone. It needs to be lightweight and strong but not so light that it’s unstable in a breeze. The best models use carbon fiber in their construction, at least in part. Carbon fiber is light and incredibly strong material that consists of thin (5–10 micrometers) crystalline filaments of carbon. Look out for quality plastics and rubberized mounts for other parts. The better the materials and protection a drone has the less damage it’ll suffer during those inevitable crashes and collisions. This is not a highly technical guide stuffed with confusing jargon. The language used is plain and to the point. I highlight all the essential features and talk about the drone’s ability as a racer in its category. Follow the ‘Best Price Check’ links at the end of each review if you want a full list of technical specifications. I cover the important ones in the review tables but you can dig deeper if you want to. Design/build (materials, type of frame, weight, etc. Navigation systems: GPS, radar, etc. Motors: brushed, brushless, type, power, brand, etc. Drone assembly, i.e. RTF, ART, BNF, full kit, etc. This guide touches on a few of the items above but only at the practical level. Unlike consumer camera drones, racing drones are not always aesthetically pleasing to the eye. You’re buying a craft based on performance, not good looks. Consider those that have stood the test of time. Weigh up all your options and understand that faster is not always better. Speed is important but it’s not everything. Remember to look at flight times, build, access to spares, and reviewer’s opinions. You don’t have to be a mini engineer to become a talented racing drone pilot. Even so, the more you learn about the way these machines fly, their optimal settings, capabilities, and limitations, the better. I have organized these drones in order of editors rating for your convenience. I’ve also sorted them into two price categories; under $300 and under $500. At the end of each review is a table with three useful sections. These include the most important tech specs for the craft and two columns for the pros and cons. I write these reviews based on three factors. One is from personal experience in cases where I’ve handled the machine myself. The others come from expert opinions and real user reviews. Below are my top seven racing drone picks at a glance. The full reviews follow this table. RTF = Ready to Fly. ARF = Almost Ready to Fly. OK, let’s look at these racing drones and the reasons I’ve picked them out. 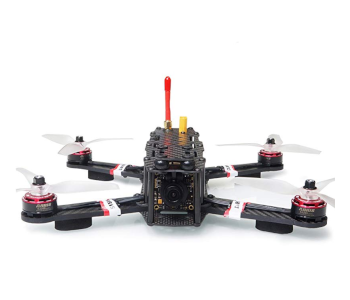 This guide focuses mainly on Ready-to-Fly (RTF) racing drones. Some of them are fast—very fast. If you get the bug for racing UAVs you may eventually want to build your own. Racers (that’s the people, not the machines) of serious competitions usually build their own drones. That doesn’t mean you can’t buy seriously competitive RTF because you can. This first section looks at fast drones for under 300 bucks. They’re all suitable to race in competitions. I’ve plowed through a lot of UAVs before I came up with these five popular choices. There’s no doubt that Eachine has embraced fast FPV drones in recent years. It’s a name now firmly associated with the thrill of the race. Eachine never fails to surprise with each new model. 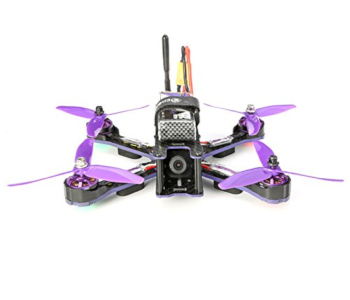 The Eachine Wizard x220 FPV is a popular drone among racers. It’s a particularly good beginner craft. The craft is RTF so there’re no steep learning curves getting to know what’s what or where it goes. It’s also pretty straightforward if you need to replace parts or want to upgrade various components. This really is a solid competing quad. It’s already proved itself a winner within the racing community. Make sure you use the manufacturer’s parts if you want to tinker with the Eachine wizard x220. If you don’t use recommended parts you’ll most likely forfeit the product’s warranty. The first thing to point out about this craft is its durability. A tough build is something that everyone wants, of course. It’s especially welcome with newcomers who always experience plenty of crashes. There aren’t any actual beginner modes with this UAV. The absence of one key land & return and altitude hold, etc., means you have to stay alert. Still, alertness is all part of racing these flying robots. The drone has rubber grommets that help to protect the power cables and the VTX antenna connection. You also get Neoprene (synthetic polymer) bumpers at the bottom of the arms. The protective side plates are yet another good feature. The spare props let you fly with more confidence as you’re not quite so worried about damage caused by crashes or collisions. I suppose the biggest gripe is that there’s no instruction manual with the product. As it’s a popular craft there are plenty of guides online (including YouTube) to help out if you get stuck. The four powerful motors and triple-bladed props give the craft plenty of impressive lift and speed. Once comfortable with its fast pace there’s the potential to fine tune it and take things up a notch. This drone doesn’t come equipped with a GPS or telemetry system. There are, however, some guiding lights on the left (red) and the right (green) sides. Not that lights matter whenever you fly in FPV. On the subject of FPV, note that you don’t get any goggles with the Eachine Wizard x220. You’ll probably want some, though. The EV800 glasses from Eachine should work fine, but there are others. This racer comes with a 700TVL camera. It works well with the Wizard and does a great job of becoming your eyes in the sky. It’s good in low light too. And the field of view (FOV) is spot on. The LiPo 3S 1500 mAh gives you 10-12 minutes flight time at full pelt. That’s quite impressive. What’s also impressive is the quick 30 minute battery recharge time at 4 amps. Anyone who wants to get into drone racing should consider this Ready-to-fly racer for less than 300 bucks. 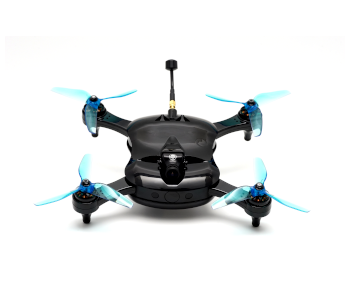 It’s durable, refined, fast, and sports a great FPV camera to boot. The EACHINE Racer 250 FPV is a good quality entry-level Almost-Ready-to-Fly (ARF) drone costing around 150 bucks. It’s solid, it flies fast, and it’s a name we’ve come to trust in racing quadcopters. I’d say the Racer 250 is the perfect FPV craft if you’re new to racing but not new to flying drones. If you’ve never flown a drone of any description then you could find this little beast a bit hard to handle. It can be fiddly to set up and configure for anyone who has little experience. There’s no real ‘wow’ factor unboxing the drone but then again “bling” doesn’t win races. The EACHINE Racer 250 wins, though, and that’s the point. Don’t let the lackluster packaging put you off. 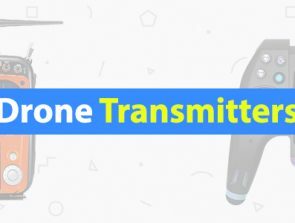 The drone comes with an inbuilt 5.8G transmitter with its own On Screen Display (OSD). It’s a no-thrills OSD but it has all the necessary information you need for a racing quadcopter of this type. There’s a bit of assembly to do but not much. The user guide is next to useless but there’s plenty of help online for anyone who gets stuck. A lot of beginners prefer to watch YouTube tutorials anyway. Once assembled the Racer 250 takes on a new form. It not only looks like a serious racer if flies like one too. The First Person View (FPV) camera is tiltable. That’s just what you need for a racing quad. Another nice feature is the ultra-bright headlights—some of the brightest I’ve seen. The lights are handy if you race at night time. There’s a simple switch on the craft to turn the lights on and off. There’s more to marvel than the low price tag and powerful brushless motors. You can even use non-proprietary components. That simply means you’re not restricted to manufacturer-only parts. The battery compartment is nice and secure. I mention this because some drones have problems keeping their batteries in place during flight. Now let’s look at what’s not in the box and what you need before taking to the skies. Before you can fly the EACHINE Racer 250 you must attach a receiver (not included). This can be a monitor with an onboard or external receiver. Or you can use a pair of FPV goggles (not included). You also need to download a software program called Open Pilot GCS to configure the drone. For the record, GCS stands for Ground Control Station. It all sounds a bit fiddly but it’s not hard for anyone with a little experience in setting drones up for racing. And there’s always a bunch of online help tutorials for those who need extra guidance. The quad’s smooth handling impresses almost everyone who flies it. And don’t worry too much about those inevitable crashes or collisions. This drone has a pretty tough carbon fiber anti-fall structure. I can’t find reliable top speed data for the EACHINE Racer 250 but it’s quick. Not only is it fast but it’s responsive to commands and easy to manipulate once you get the hang of things. There’s an impressive adjustable HD FPV camera despite the low cost. It has a wide dynamic range and produces superb video quality for a camera in its class. No complaints there at all. You can’t go wrong with the EACHINE Racer 250 if you don’t mind a bit of tinkering. If you want an easier entry-level drone then look at some of the Ready-To-fly (RTF) options on this page. Let’s be honest here and admit that people—males in particular—get a rush from speed. It’s still important to recognize the 100mph drone speed restrictions set by the FAA. No one new to drone racing should attempt to get anywhere near these speeds. Not only are some drones super-fast they’re also over-responsive. That makes them fit for experienced users only. This section has some very nice racing drones for you to consider. I’ve worked my way through a lot of flying robots before I came up with this shortlist. Enjoy! Aside from pilot skills, the two things you want for racing drones is a craft that is fast and agile. You can check both those boxes with the Walkera F210 3D racer. This quad is going to impress you whether you’re a raw beginner or a seasoned expert. It’s why they sell like hotcakes and continue to be a well sought after craft in the drone racing community. That’s a pretty simple list compared to some racing quads in this guide. There’s nothing missing, though. 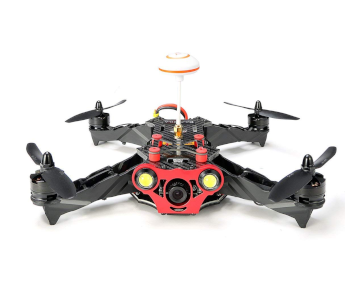 The drone itself has a sleek full carbon body which gives it a durable, anti-shock design. There’s a CD for the controller, a quick-start guide, and a user manual for learning about the parts, features, and functions, in more detail. You also get a handy little toolkit and an extra battery. The F210 3D racer is smooth and fast but it doesn’t have any safety features like GPS or a return-to-home function. To get these you have to go with the 250-Advanced version. You can expect to push the F210 to around 50 mph in optimal conditions with a minimum payload. It might not be the fastest drone but winning races is also about pilot skill and how the craft handles. As a racer, the Walkera F210 3D’s carbon fiber frame and protective aluminum should keep you going after a few knocks. It’s also responsive, agile, user-friendly, and has customizable flight firmware. The FPV experience with the F210 3D quadcopter is remarkable. This is thanks to the advanced 5.8 GHz live-video and the On Screen Display (OSD) System, and the 700TVL camera (included). The popular 120° 700TVL camera delivers images that are clean and crisp when using FPV goggles. The camera also tilts to provide the perfect angle for your racing needs. The craft uses a 4S 1300mAh 40C battery. It gives a flight time of around 5-9 minutes depending on flying style and environmental conditions. Battery recharging takes around 90 minutes. I particularly like the Walkera F210 because it’s a solid crash resistant racer. 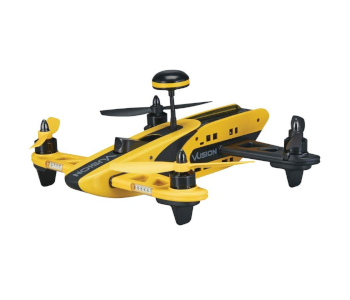 It uses powerful brushless motors that help to make it a responsive flyer. There are some useful flight modes to boot. The only major disappointment is that the video signal is occasionally poor and fails to bind (link) to the transmitter. All things considered, though, it’s a tough little craft with many more pros than cons. The above rating assumes the all-new Teal lives up to its claims. A new rating will follow in time. The all-new Teal drone really is a breath of fresh air. A teenager called George Matus created it and has plenty to boast about. It’s certainly a beautiful design. And it claims to be the fastest Production Drone. 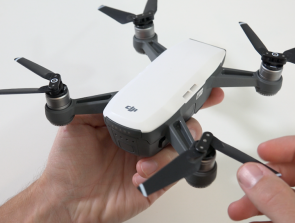 This is also the most expensive drone in my reviews. And because it’s new I can’t say whether it’s worth the higher price tag. What I can say, though, is that it certainly looks promising. A unique feature of this quad is its wide appeal. The company targets the Teal at all drone users and at every level. Here’s why it’s more than just another racing quadcopter. This is a Ready-To-Fly (RTF) craft. That means you can pretty much take to the skies after you unbox it. Let’s look inside the box before we review its best features and key attractions. No assembly, no soldering, and no tinkering. The Teal is ready to fly when you are. Already there are claims and counter-claims about the Teal’s top airspeed. I haven’t had the privilege to handle one of these beauties—yet. For now, I’ll use the company’s data which states 70+ mph. Another appeal for many drone enthusiasts is that they make the Teal in the USA. The high-quality frame is upgradeable, fully modular, and durable, thanks to the Carbon-Infused Plastic. Some are already calling the Teal the smartest drone in the sky. That’s quite a claim considering it hasn’t been around long enough to pass the test of time. So what’s getting everyone so excited? Well, there’s an onboard supercomputer with the Nvidia TX1 Processor. It possesses machine learning, image recognition, and uses a software development kit (SDK) to allow for third-party apps. Flight control options via mobile app are also impressive. There’s a WiFi range in the neighborhood of 300 ft. or 2,500 ft. with extender. You can fly this quad with a hobby controller, smartphone, or tablet. First Person View (FPV) footage transmits into a handset or FPV headset at a clear 720P. The company has plans to offer a secondary camera for first-person-view racing. Those who just want a camera drone will be happy with the photo and video capabilities. For capturing still images the Teal sports a 13MP camera. And it can produce video up to 4K resolution @ 24fps. There’s more good news. The battery recharge time is just 30 minutes. And to make things even better new batteries are inexpensive. These are huge developments and very welcome advances. 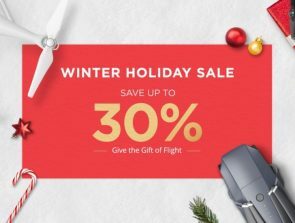 The biggest bugbear with any drone enthusiast is short flight times, long recharging times, and the high cost of spare batteries. It looks as though Teal has set a new standard on all three issues. The exciting new Teal quadcopter all-rounder drone is getting a lot of enthusiasts excited—me too. But it’s still brand new. That means the real verdict from actual users has yet to materialize. On the face of it, the Teal Sport Freestyle and Racing drone checks a lot of boxes. I’ve even dared to make it my top pick. If, however, it doesn’t live up to expectations then I’ll downgrade it accordingly. What we have here is a racing drone that moves away from the Meccano style. In other words, it has that polished, finished look. It’s time to review the RISE Vusion 250 Extreme Ready to Fly (RTF) quad. This is an excellent racing drone at the entry-level. I know looks are subjective, but compared to a lot of racing UAVs I think this bright yellow craft is very pleasing on the eyes. What you get is an all-inclusive FPV bundle they call the “race pack”. It’s such a good-looking craft that you might be afraid to race it for fear of a crash or collision. Don’t worry! The RISE Vusion 250 can bounce back from accidents and impacts no problem at all. This is thanks to its tough, impact-resistant, injection-molded airframe, and segmental or modular design. Everything arrives pre-installed and tuned up. In short, this handsome quad is ready to race straight out of the box. It’s better for the novice to crash this drone than a costly full-tilt racing quad. Don’t let the safety aspect deter you. This is still an aggressive racing drone that’s sure to give any first-time flyer or professional a lot of fun in the air. The 6-channel 2.4GHz transmitter has a nice quality to it and feels comfortable in the hands. It’s pretty intuitive so doesn’t take long to become familiar with its physical features. Another great aspect with this drone is the three flight modes. Mode 1 is a beginner mode and automated. Mode 2 keeps auto settings but gives you more control over roll angles and tilt. Mode 3 is where the confident and competent pilots get to show off. There’s no auto-level feature engaged or limits on tilt and roll rates. There’s certainly a lot to play with and it’s heaps of fun. At 7-8 minutes the flight time is a bit disappointing. But then this is a bigger and heavier craft than some of the lightweights in this guide. The battery recharging time isn’t too bad at 90 minutes. It’s always a good idea to carry a spare set of batteries otherwise your fun will be short-lived. The drone comes with its own pivot-mounted 600TVL camera positioned at the top of the craft. The 2MP photos and 1280x720p @ 30fps AVI video recordings do a good job. For the ultimate First Person View (FPV) just slip on the rather large goggles (included). They house the LCD monitor (included) to give an incredibly immersive flying encounter—perfect for racing. What we have here is an affordable racing quadcopter that just happens to be beautiful. It’s also agile, robust, and fast, though the makers don’t actually disclose its top speed potential. The most important thing for the racing beginner is the user-friendly features and easy controls. It’s also nice that you can work through the flight modes as you become a better racing pilot. There are a few gripes but they’re only minor points. Some people will find the FPV goggles too big and bulky. Another complaint is that there’s no charger for the monitor. Not sure why they left that out. Taking everything into account, though, this is a fabulous entry-level racing drone. It’s certainly earned its place on this review page. And if you don’t like yellow there’s now the VUSION 250 Black Edition. The Diatone GT200S Stretch FPV Racing Drone is an impressive copter. It has an immaculate build and flies through the sky like a mechanical bird of prey. It’s unquestionably a great little racer. Even the box shows how much attention to detail the company puts into their product. The entire package oozes quality and it feels as solid as it looks. Note that this is a Plug-N-Fly (PNF) not a Ready-To-Fly (RTF) quad. PNF means there are some assembly and configuration (knowledge) needed and maybe some extras like receiver and battery, etc. If you’re a racing drone novice you might want to skip PNF quads for now. Either that or prepare to take some time learning how to set up and tinker your new flying robot before taking to the air. There are various deals around and they don’t all include the exact same items. Check to see what’s in the box before you make a decision. You have plenty of options if you need to source your own receiver and pair it with a radio. You may want to check out the X4R-SB and FrSky Taranis Q X7 for a capable setup at an affordable price. I haven’t been able to find official confirmation on the top speed of the DIATONE CRUSADER GT2 200. There’re some reviewers who claim to have clocked it at 90+ mph. I’m not so sure, but it is fast. This craft is ideal if you’re not 100% certain whether you want to race. It’s a hybrid as it doubles up as a very competent camera drone. The camera mount can accommodate a popular GoPro. Everything about this tiny craft is impressive. Although there’s some assembly to do it’s all plug-in stuff. That means there are no complex instructions or soldering to contend with. The Crusader’s GT2 200 First-Person-View (FPV) experience is certain to impress any racing pilot with its 3D augmented virtual reality. And the FPV 600TVL racing camera is popular for very good reasons. The flight time will vary depending on the payload, how hard you push the craft, and environmental factors. In ideal conditions expect around 7-minutes. Always make sure you carry spare batteries. The battery recharging time is quite standard at 90 minutes. Summing up this drone I’d say it’s one of the best out there in its price range. It does require a bit of tinkering and that could prove fiddly for the novice. For experienced pilots, though, it’s a real winner. My only gripe—and this really is minor all things considered—is the absence of any spare components. If any UAV is going to need a few spare parts in the box it’s gonna be a racing drone. This is a fine little quad that’s perfect for racing enthusiasts. The one here is the Almost-Ready-To-Fly (ARF) version (cheaper). You can also find Ready-To-Fly (RTF) versions if you don’t want the fuss. Note that what you get and how it comes depends on which product you opt for, i.e. ARF, RTF, new or refurbished. Even with the new ARF products there are a couple of things you don’t get but need. There’s no official top speed for this craft but it’s fast. I’ve seen a few wild claims around but no mention in the product manual. I won’t speculate other than to say this thing moves. The standard 1806 brushless motors that come with the Speed 250B are smooth and reliable. If at some point you decide you want more speed you can change the motors and go faster. Maximum flight time depends on payload and battery. There’s no battery included with the ARRIS X-Speed 250B so make sure you choose a good one. Opt for 3S 11.1V 1500 mAh up to 2200 mAh. With the right battery and optimal conditions, you can expect around 10 minutes of flight time per charge. This is average for a small racing quadcopter like this. The camera is a 700TVL and does a good job with no notable delays. The video quality is not the highest priority with racing drones, but this one is certainly fit for purpose. There’s an option to adjust the First Person View (FPV) camera (useful for racing) from 0-20°. There’s also a handy vibration damper plate to filter vibrations so that the video can remain constant. FPV is at the crux of drone racing, especially with FPV goggles. Fat Shark Dominator V3 goggles work well with this craft. With the 700TVL camera, you get to see what your drone records in real time. Another key feature of the ARRIS X-SPEED FPV250 is the robust frame and durable arms. Crashes and collisions are inevitable at any skill level. It’s good to know the quad offers decent protection. I also like the idea that you can customize this racing quad if you want to. You can personalize it to match your personality and style. It’s hard to find too much fault for the price. I suppose the main gripe is not having everything you need in the box to fly (ARF). The other downside is that the frame construction is quite complicated for the novice. There are just too many parts. Overall, though, this is a competent little craft that’ll give racing drone enthusiasts a lot of joy. 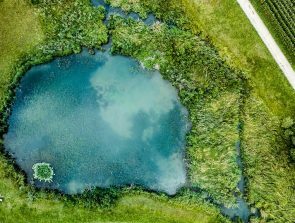 How To Find Awesome Drone Photography Locations?